Cala Millor is the biggest holiday area on the East coast of Mallorca, and after Platja de Palma the second biggest on the island. The home countries of the tourists here are mixed: Most are from Germany, but there are also many Swedish and English here. The beaches and the tourist infrastructure are great. There are not many sights in the area. Prices are average. One disadvantage of Cala Millor is the long transfer from the airport (about 90 minutes by car). Along the beach is a wide pedestrian promenade. For several miles you will find shops, cafes and restaurants here. In summer it is as crowded here as in the central shopping street of a big city. Further away from the beach are the hotels, which are mostly ugly concrete blocks. Cala Bona has totally grown together with Cala Millor, so much so that most tourists do not realize it is another town. There is a nice centre with a port in Cala Bona. 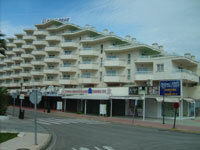 The rest is a typical package holiday town like Cala Millor. Sa Coma also grew up together with Cala Millor in the other direction. These are maybe the ugliest towns on Mallorca – just souless cities catering for mass tourism, including ugly hotel skyscrapers. Here, there are many British tourists. The beaches are OK and prices are low. S´ Illot: The next town in direction to Portocristo. Much nicer than Sa Coma, but it is let down by its uninspiring beach. 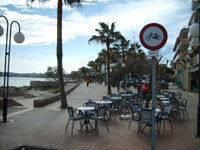 Bus Connections to Cala Millor: There are many bus stops on the main road of Cala Millor which runs parallel to the beach about 100m back from the water. Between all above mentioned towns there are buses at least hourly (in winter, much less). To Palma de Mallorca there are at least (depending on the season) 8 buses a day. At more than €7, a ticket the bus between Palma and Cala Millor is the most expensive on Mallorca. If possible, try to use one of the express buses (shown on the timetable at the bus stop). The other way to go by public transport to Palma is via the hourly train from Manacor. There are hourly buses to Manacor with connections to the trains. Most buses to Palma stop in Portocristo and at the Dragon Caves. There are also some buses everyday day from Cala Millor to the more northern holiday areas like Alcudia, Can Picafort and Pollensa. There are boats connecting Cala Millor with other towns in the area (for example Calas de Mallorca, Portocristo, Cala Romantica and Cala Ratjada). Prices are high – expect anything from €8 to €20.